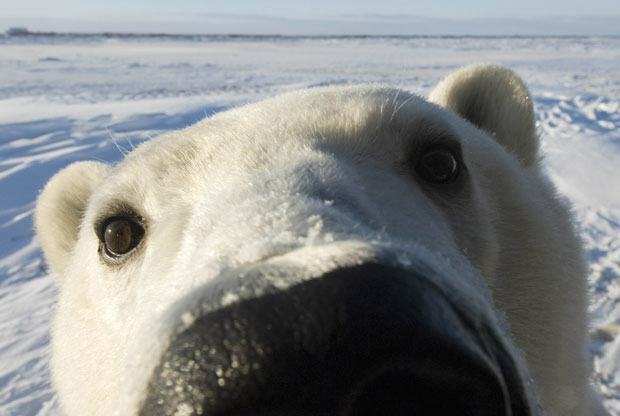 The first polar bear cub to be born on British soil for 25 years has emerged from its den in Scotland. Before the baby bear emerged, people had only heard high-pitched noises coming from the maternity den. 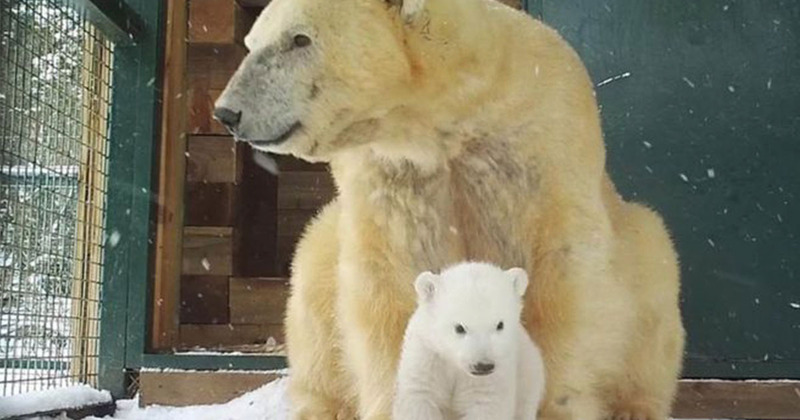 The cub was born in the week before Christmas after its mother mated with one of the two male polar bears at the Royal Zoological Society of the Highland Wildlife Park at Kincraig. 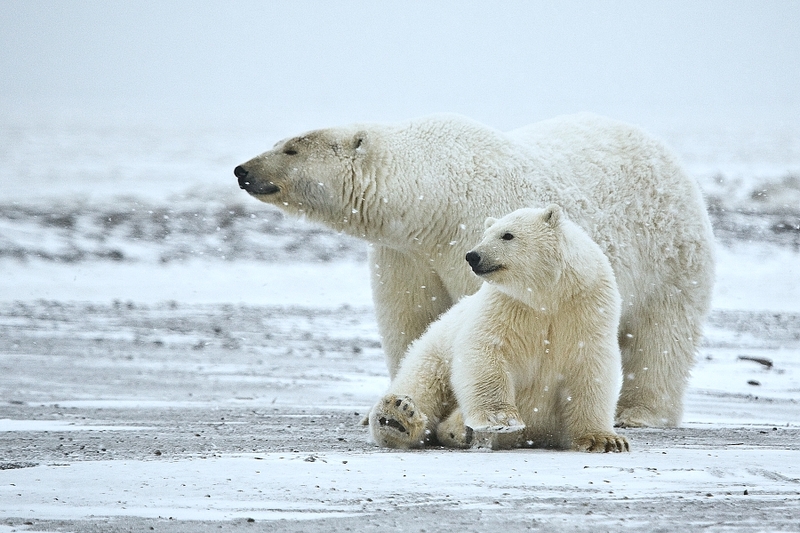 Victoria had started to come outside by herself for short periods to eat, drink and roll around in the snow, so we knew her cub would soon follow her but we couldn’t be sure when. I was visiting Victoria on Sunday morning to check she had fresh water and to continue slowly reintroducing food to her diet, after four months during which she lived solely off the fat reserves she built up before she entered her den. Suddenly I saw a small, fluffy bundle next to her and had to pinch myself to check I wasn’t seeing things. It was a very special experience and one I’ll never forget. We also have motion-sensitive cameras safely positioned near Victoria’s den and we were delighted to see we had captured her cub’s first few steps outside. The baby’s mother, Victoria, has been given some space to nurse her new born and their enclosure has been closed to the public. It’s expected to be re-opened to visitors later this month. You can still see the newborn though as the first image of the cub is from footage filmed by STV Productions for a Channel 4 documentary. Having only been able to hear sounds from inside the den before, we can now be certain Victoria has had one cub rather than two and we couldn’t be happier as this is the moment we have been working towards and really looking forward to. Both mum and cub appear to be doing well, though this is still a sensitive time and they need as much peace and quiet as possible. Our keeper activity at their enclosure will remain at a minimum for the next couple of weeks, after which visitors will be able to see Victoria and our wonderful new arrival. In the coming weeks we’ll also be able to find out if we have a little boy or girl and then we’ll decide on a name. We wish the mother and her baby all the best! Hopefully Scotland is cold enough for the little one.